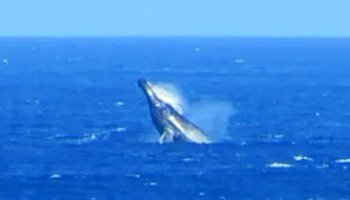 Humpback Whale Watching Hawaii: Fun and Free Every Winter. Free Hawaii Humpback Whale Watching Every Winter! 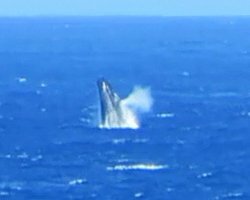 Every winter, ‘tis the season for humpback whale watching in Hawaii. And by “winter” I mean that you could have virtually non-stop sightings from mid-January through mid-March, and you might get lucky any other time from October through May. Listen to the podcast we recorded in the first week of February and you'll know what I mean by "non-stop". 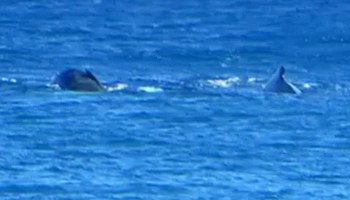 The experts tell us that you can watch humpback whales from December to May. However, I don’t remember ever seeing any in April or May, but I have seen them as early as October/November, and I once saw a whale in June. I think this last guy took a wrong turn at Albuquerque. Anyway, I’m not a humpback whale expert. So I’ll suggest that you might want to look elsewhere if you need a bunch of scientific information about these annual Hawaii visitors. But I’m pretty darned reliable when it comes to looking at a calendar; and I’m also very qualified to see the ocean surrounding Oahu. Fortunately, those are the only skills you’ll need if you want to do some whale watching during your vacation to Hawaii! Of course, you can pay for a whale watching cruise; and I think several of them offer a guarantee that you’ll see whales or take you out again until you do. That’s a good deal. But having been on one such tour, I can confidently say that it’s equally exciting to see them for free from the shore – and you’ll avoid the seasickness (if you’re prone to that). But the beach doesn’t make any guarantees; so it’s up to you to decide how important a Hawaii whale sighting is to your overall Hawaii vacation experience. Want the guaranteed whale sighting experience? Book a tour. Whale Watching Cruises on the island of Oahu - CLICK HERE! (Link opens a new window/tab). Like some other intelligent mammals, humpback whales choose to spend the winter in Hawaii rather than Alaska. Who can blame them? Brrrrr! Their ultimate goal, however, is to get to Maui, where they raise their newborn calves in our temperate Hawaiian waters before returning to Alaska in the warmer months. But to get there, they have to swim right past Oahu. Look at a map, and you’ll see this means they generally arrive on Oahu’s north shore, and then they hug the coast down to Makapuu, where they cross the Kaiwi channel to Molokai and beyond. Most of the pictures on this page were taken on one day in early February along the Kaena Point (north) trail. In the span of two or three hours, I had at least 50 humpback whale sightings. That means you can see them from just about any location that has an ocean view. But some spots are definitely better than others. Probably the two best spots for shoreline whale watching on Oahu are at Kaena Point (both north and west shores) and at Makapuu Lighthouse. 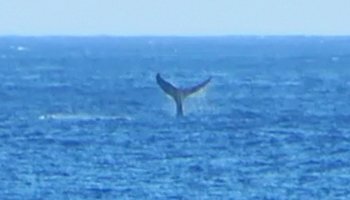 Nevertheless, throughout the years, I’ve had numerous Hawaii whale sightings all along the north shore from Banzai Pipeline at Ehukai Beach Park to Mokuleia. I’ve also seen them from the area around Hanauma Bay, Aulani, Magic Island, Ala Moana Center and even from various tall buildings around Honolulu. 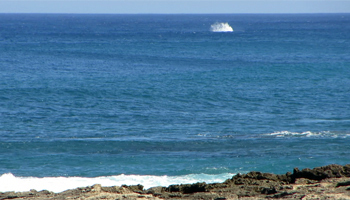 The only shoreline that’s not particularly great for whale watching is the Oahu east shore. This is because much of the shoreline has a shallow shelf/reef that extends farther off-shore than the other sides of the island. The whales are still there, of course, but they’re farther away and harder to see. Usually, the first sign that will tip you off to the presence of whales is the telltale blow spout. Whales normally breathe every minute or two when they’re near the surface and taking it easy; so these spouts are frequent and simple to spot. 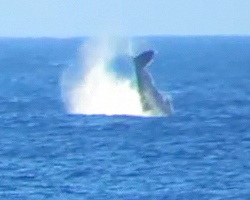 After seeing a spout, look for the whale’s back to pop up on the surface behind the spout. Then look farther down the whale’s back, and you might also see the distinctive hump for which these animals were named. It’s less common than breathing, but still fairly likely that you could see whales breaching, slapping the water with their fins and flukes, and/or raising their tails out of the water. Nobody knows exactly why humpback whales are so active, but they really are – to the point of appearing playful for the sake of fun. For example: on the day I took these pictures, I watched one whale raise its fluke out of the water and slap it around over and over for four or five minutes straight! 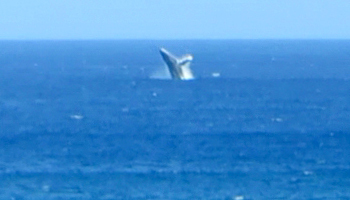 My theory is that the whales are just happy to be in Hawaii; but I can't prove it! 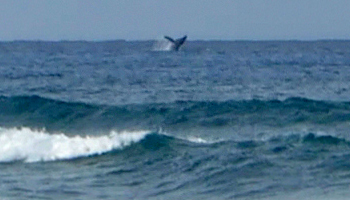 On the same day, I saw whales breach (push the head and upper body up out of the water) more than 20 times! They’ll often only go high enough to get their eyes out of the water; but sometimes they’ll get the majority of their bodies out of the water as well and then come down with an incredible splash! Even when you miss seeing the whale breach, you’ll know it happened just by the size of the splash. Here’s some good news to help with your whale watching… I’ve noticed a somewhat consistent tendency for humpback whales to repeat their actions. That’s how I was able to get these photos. 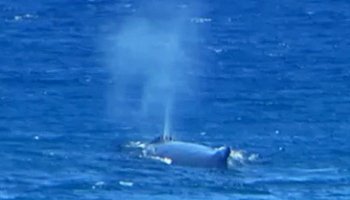 If they breathe once in a certain spot, the chances are good that you’ll see a second blow spout in almost the same location before the whale dives out of sight. If a whale breaches once, it will frequently do it again in almost the same location. If it rolls around and slaps its fins on the water, it will often keep doing so for a while. So look for the signs and then stay focused on that same area for a minute or two before looking away. Humpback whales also frequently stay close together in pods of at least two or three; so where you see one, you might also see others. The pair of whales in this photo appeared to be a mother and baby – with the little one flopping all around the big one while the big one just seemed to rest. When you train your eyes to see the whales themselves – instead of just the spouts and splashes – you may start to notice some of them just floating at the water’s surface. Again, look for the distinctive gray hump. You can plan a whale watching adventure, or you can just keep your eyes open for telltale signs when you’re in view of the ocean. The key is to realize they’re out there and look for them. On the day I took most of these photos, I talked to at least a dozen other hikers who had no idea that scores of humpback whales were breaching and splashing like crazy less than 1 km off-shore! Then when I told them what they were missing, they too started to have multiple sightings; and they were thrilled! That could be you too.